For the 5th Edition of the Ask the Expert series, we were privileged to have certified strength and conditioning specialist Joseph McAuliffe, CSCS. McAuliffe has been a fitness professional for almost a quarter of a century and is the Program Director of Edge Sports Academy and Health Club in Eatontown, NJ. At Edge Sports, he overseas all the sports-specific strength and conditioning programs at the company’s 30,000 square foot facility and trains nearly 450 competitive athletes (many of which are in group settings) each year. He has trained over 300 Division I scholarship athletes in virtually every sport and boasts a star-studded client list of professional athletes that spans Olympians to the WNBA to MLB and the NFL. Most notably, he trains NFL rookie Donald Brown—the former University of Connecticut standout and Indianapolis Colts backup running back who most recently appeared in Super Bowl XLIV. 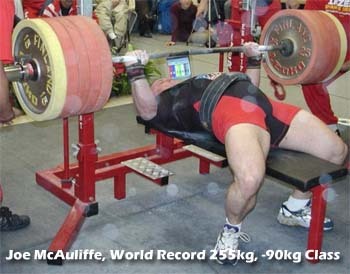 McAuliffe’s training regimens for competitive athletes are rooted in his background as an elite powerlifter. As a 4-time Drug-Free World Champion, he continues to make his mark at the age of 44. He is the reigning 2009 USAPL Raw National Champion in the Men’s Open 198-pound Division, where he recorded a staggering 1603 pound total among the three-exercise competition: squat (573 lbs. ), bench press (424 lbs. ), and the deadlift (606 lbs.). McAuliffe has been focused on preparing for the USA Powerlifting Championships for the 2010 Arnold Sports Festival, which is happening this weekend. His start in the training business was by happenstance, but his story took a turn that even McAuliffe couldn’t have predicted. In 1990, after obtaining a BS in Kinesiology from Cal State, he decided to head south and enrolled in a graduate program at Long Beach State University to study Exercise Science with an emphasis in Strength & Conditioning. To jump-start his professional career, McAuliffe applied for an opening as a Graduate Assistant on the football team. At the time, Hall of Fame NFL coach George Allen was the head coach, in what would be his last stop in the coaching ranks before retiring from his legendary career. According to McAuliffe, Allen received five applications for the open position. As a dedicated powerlifter with solid grades and the passion to teach his special gift for lifting weights to college football players, McAuliffe was confident that he had the credentials to get the job. McAuliffe told me he was the first candidate that Allen interviewed and when he walked into Allen’s office, Allen was on the phone with his back turned toward the door. That’s when McAullife says he heard Allen say to whomever he was speaking with, “Frank, I’ll have to call you back. One of my interviews just arrived.” It turns out that the “Frank” Allen was talking to, said a laughing McAuliffe, was Frank Sinatra, as the two were trying to do a fundraiser together. “It was the toughest interview I ever had,” said McAuliffe. He claims that Allen grilled him so intensely about why he wanted to do the job that he lit his inner fire, causing him to stand up and launch into an impassioned rant as to why he deserved the job. At one point, McAuliffe went so far as telling Allen, “I grew up hating you because I’m a Giants fan,” he chuckled. Once Allen saw that McAuliffe couldn’t be intimidated and possessed an incredible passion, enthusiasm, and intensity for strength and conditioning, the job was his. In fact, according to McAuliffe, Allen said, “I found my guy” and cancelled the four remaining interviews. The story gets even better. Once McAuliffe had the job locked up, Allen instructed him to attend camp and pretend that he was trying out as a walk-on, so that he could motivate the team in the weight room. After McAuliffe put on an impressive display of strength and outlifted the strongest player on the team (he squatted 675 pounds), Allen introduced him to the team as the new Graduate Assistant. McAuliffe was then assigned to train a group of players who had been ruled ineligible, many of whom were Prop 48 players who didn’t qualify academically or who had run-ins with the law. According to McAuliffe, he started with a group of 15 players, but half of them quit after a week, and then, the other half after a month. Two of the players would end up making the team. One of those two players, Jay “Sky” Walker, had to sit out a year after he gave up his minor league baseball career to pursue football. Walker confirmed that McAuliffe’s training regimens were extremely intense and that “he was really, really good. I was a city kid…and he had us doing powerlifting routines.” After transferring to Howard University, Walker would end up playing in the NFL as a quarterback for 4 years, two with the New England Patriots and two with the Minnesota Vikings. After an exciting season at Long Beach, McAuliffe moved back home to New Jersey after his father had a stroke and obtained a Masters Degree in Exercise Science from Montclair State University. He ran his own sports performance training business in New Jersey up until a few years ago when he became the Programs Director at Edge Sports. McAuliffe prides himself on being a drug-free athlete and is also a zealous advocate for steroid prevention and education. In 2005, he provided expert testimony to the Governor’s Task Force on Steroid Use and Prevention for the State of New Jersey. This led to New Jersey becoming the nation’s first State to implement a steroid testing program for high school athletes. McAuliffe believes that good habits and an active lifestyle are the keys to success and longevity, and his mission is to continue to lead, educate, and motivate athletes to reach their goals. (1) How would you describe your approach to training athletes? My approach to training athletes has evolved through 23 years of training and competing myself, while coaching others to do the same. I believe that by practicing what I preach and living what I teach allows me to deliver quite a powerful message about lifestyle. I engrain good habits [in] my athletes by teaching them to work on all aspects of fitness, positive attitude, and nutrition. In the fitness area, we work on power, agility, strength, speed, cardiovascular function, and flexibility. I urge them to eat natural foods and stay hydrated, while always maintaining a positive outlook on life. The great thing is every athlete has different needs and goals so the art of evaluation is my strongest suit as a coach. 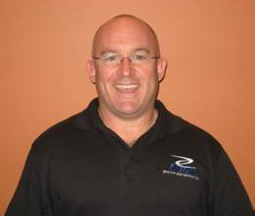 (2) How have you differentiated yourself from other strength and conditioning specialists in the sports industry? Currently, I might be the only strength and conditioning coach who is a reigning National Drug-Free Powerliting Champion (still holding world records) and a Certified Strength and Conditioning Specialist holding a Masters Degree. I also might say my client diversity is hard to beat—Ages 7 to 85 (Bruce Springsteen's mom)—as well as having success with multiple sports at every level. (3) What is it about your training programs that has attracted over 300 Division I athletes and numerous professional athletes, both male and female, to become your clients? With my 23 years of experience, I’ve trained over 4,000 student-athletes. I have worked in the high school and collegiate settings. I pride myself on getting results in the gym, combines, camps, and most of all, on the field of play, as the student-athletes I train tend to dominate our local sports scene. However, it is my relationships with tutors, recruiters, guidance counselors, coaches, and athletic directors that help me enable my kids to get the best offers possible. Luckily, some of my kids have become quite popular in the media and that helps spread the word. Success breeds more success. Word of mouth in this business is the key. (4) Do you incorporate powerlifting into your training programs differently based on what sport the client plays? The sport of powerlifting involves maximum efforts on the barbell squat, bench press, and deadlift. Unless the athlete is a powerlifter, I will not use a powerlifting routine on the athlete. However, those exercises are tools that we use to build strength, speed, power, and flexibility in a variety of ways for many different athletes. The sets, reps, intensity, rest periods, and tempo vary depending on age, gender, sport, and ability level. (5) How applicable are powerlifiting exercises for elite basketball players? Do you think powerlifting is overly excessive for basketball players, in that basketball is largely a finesse-driven game? I work with lots of basketball players and none of them do powerlifting routines, as they are way to extreme for the usually tall, lanky player. However, the squat, bench press, and deadlift exercises are very effective to help a player develop size, strength, speed, and power. Sets, reps, intensity, frequency, and tempo are all different for different ages, genders, and ability levels. When these lifts are appropriately used, they also prevent injuries. (6) What tips can you give to basketball players seeking to increase their vertical leap? The vertical leap can be improved with explosive power training exercises like Olympic lifts, plyometrics, and dynamic stretching. The squat also aids in developing leapers, as it teaches good extension (thrusting) of the hips. The more an athlete can lift over his/her body weight, the easier it is to overcome their own gravity against the ground. The greatest leapers I have ever trained all squat 1.5 times their weight. Donnie Brown squats more than triple his weight and can jump 42 inches. (7) How did you help prepare your two players who were drafted into the NFL last year? I worked very closely with Donald Brown for three years while he was in high school and when home from the University of Connecticut. I helped Knowshon Moreno ready himself for Georgia. The most important things I gave both of them was great technique in the weight room and the good habits of nutrition with a positive attitude. (8) Do you train a lot of professional athletes in the off-season? I help lots of local kids looking for shots in the NFL, NBA, and Major Leagues. Most of my clientele are elite high school and college athletes. Donnie Brown trains with me when he's back home here in Jersey. (9) Given your background and experiences with steroid prevention in sports, do you think that there is a steroid problem in the NFL that has been flying under the radar and been overshadowed by the steroid scandal in baseball? My personal opinion is that all sports have people who cheat to win. I know the NFL has been busting cheaters for years, as their steroid policy has been enforced for a while. The drug of choice for people with lots of money now is HGH (Human Growth Hormone), which is undetectable with current drug tests. I know MLB dumped a lot of money into research for this test, and in my opinion, it will open Pandora's box in both leagues if the powers to be can detect it. No matter what they do to test, there will always be unethical doctors and scientists eager to make a buck who will find a way to beat the test. I feel sorry for the guys who have to cheat to compete. They must not have learned that we humans have all the HGH and testosterone in our bodies already and all you have to do is eat right, train hard, and get lots of rest. I know that you won't ever see the names Brown or Moreno on the suspended list. (10) In your personal opinion, do you think that Usain Bolt is drug-free? I don’t know Usain Bolt or his coaches, trainers, doctors, nutritionist, or family members, so I can't give you an answer there. I do know he's a genetic freak physically with awesome technique. He is also an incredible competitor who performs his best when it matters most. (11) I have heard that training is 60% diet and 40% training. In your opinion, how true is that statement? I have been doing this 23 years and I have never heard any of my colleagues refer to this formula. I think that every athlete has different needs and training, nutrition, and positive attitude are equally important. (12) As a general principle, do you think that the strenuousness of powerlifting can make an athlete more susceptible to injury? The sport of powerlifting is a dangerous game. The fact is that in 30 years I’ve never met a competitive lifter who hasn't injured themselves at some point. The fact that I must reiterate is that the use of these lifts in a sports performance program are quite different than how a competitive lifter uses them. Squats, deadlifts, and bench press are actually very beneficial for injury prevention. An athlete on a consistent dose of there lifts (never doing maximum weights) offers Time Under Tension (TUT). TUT, as we refer to it in the business, increases bone density, and strengthens ligaments and tendons, thus stabilizing the joints. The key is in the professional who is in charge of the program. (13) What techniques do you use to motivate your clients to achieve their goals? After an initial interview and fitness assessment, I find their areas of strength and weakness and most of all, personal goals. If you have a big enough WHY, it is easy to find the HOW. I also practice positive attitude and show passion and enthusiasm as an instructor. All they have to do is show up and be consistent. Our facility is full of highly competitive, motivated people and it seems to spread. Each individual has different buttons that need to be pushed. Twenty-three years of experience enlighten me to push the right ones at the right time. (14) What aspects do you like the most about training competitive athletes? I am a competitive athlete myself. Birds of a feather flock together. I love training, educating, and motivating my kids. The most fun is watching them succeed in school and sports. Watching Donnie Brown eclipse the 2000-yard barrier on the last carry of his high school career was one of the most thrilling moments of my career. The only thing that is more fun is watching my own children compete and succeed. (15) Who is the most freakish athlete you have ever trained? What aspects about this individual, physically or mentally, really stood out? Donald Brown of the Indianapolis Colts. I have never seen an athlete with the discipline and dedication to making his body ready to go to the next level. A gifted natural athlete, Donnie was having trouble gaining weight and progressing with his weight training. He walked into my office as a 142-pound sophomore and left for UCONN a 200-pound stud ready to play D-I. His 40 yard dash went from 4.7 to 4.27 while weighing 178 after his junior year. Now, he is a legit 4.4 guy at 210 and strong enough to handle the pounding, as he can now squat over 600 lbs. He was the first high school athlete that I trained who powercleaned 300 from the floor and could squat over 500 lbs. for reps before graduation. His dietary discipline was unbelievable for a teenager. When he had to go to the bathroom in the middle of the night, he would always slug down a high-calorie protein shake before he went back to sleep. He also held a great GPA and now has a Kinesiology degree. I'm very proud of him and he deserves all the success he gets because HE EARNED IT. GO COLTS #31! We would like to thank Joe McAuliffe for participating in this edition of the Ask The Expert Series. If you have any questions for Joe, you can email him at joemcauliffets@aol.com. If you are a sports professional or professional athlete and would like to participate in the Ask The Expert Series, please contact Matthew Allinson or Darren Heitner for more information. In the Fourth Edition of the Ask The Expert Series, we are pleased to have Nick Brockmeyer on the hot seat. Mr. Brockmeyer is an attorney, sports law professor, and the President of Platinum Sports & Entertainment Management, LLC. In the third edition of the Ask The Expert Series, hosted in conjunction with SportsAgentBlog, we were pleased to get the perspective of Alfred Ball, Founder and President of Lifemoves® Health and Rehabilitation. In the first edition of the Ask The Expert Series, we were privileged to have Emery B. Sheer, CPA on the "hot seat." Sheer is the Managing Partner of the acclaimed South Florida-based accounting firm, Berenfeld LLP.